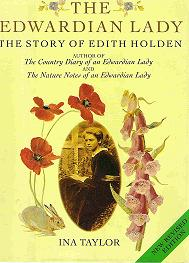 Happened to be browsing my TBR shelves, and was reminded about a biography that Mum had given me a while back about Edith Holden, who was the author of the much acclaimed “The Country Diary of an Edwardian Lady” written in 1906 and published in 1983. Although her life story is not actually that notable, it’s a pleasant journey and author/biographer Ina Taylor has done her best to fill in the gaps using sources such as Holden’s many letters and postcards. She led such a quiet life (as perhaps a lot of Edwardian and Victorian ladies did), and this seems idyllic in some ways (compared with today’s manic lifestyle). And yet, at the same time, it must have seemed like a gilded cage in other ways. This quiet life with few distractions must have only emphasized the difficulties that came with the financial troubles of her father’s business (which affected the entire family) plus the familial disputes as to how to handle the failing business plus the frequent upheavals of moving house, and all this combined must have been very stressful. Holden was an artistic child in a well-read and non-conformist family with six other brothers and sisters. Her mother had previously worked as a governess before getting married, and taught all her daughters at home, three of whom went on to Art School for formal training. (Two other sisters had to stay at home – one younger and one older.) The brothers were taught the business from an early age with an expectation to enter the family organization, and there is no mention of them having any artistic tendencies. The mother was fragile in health (and no wonder if she had seven pregnancies in ten years) and frequently tired, so oldest daughter ran the house. (Not a shock as we know how helpful those Victorian husbands and brothers were around housework. Ha.) 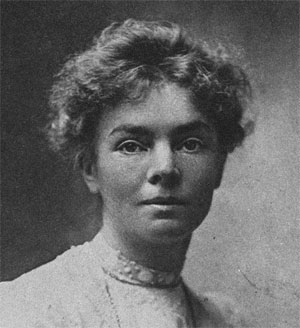 The mother eventually died much older of cancer. I wonder if her early fatigue was linked with that? She had trained as a serious artist, and spent her whole life doing paintings and drawings, mainly of animals and natural subjects (and thus, the nature notes of her famous journal). 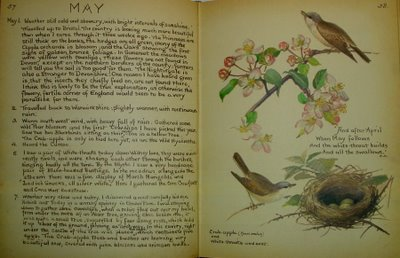 Taylor, the biographer, mentions that it was not unusual for any well-bred Victorian or Edwardian lady to keep a common-place book with nature illustrations matched with appropriate literary comments. The difference was that this one was so well done, and was also released to the public at a time when nostalgia was high for those historical times. I know that I hadn’t seen anything like it before, but then I was really quite young when it came out. With the Holden family being free thinkers, it’s not surprising that they were Nonconformists in regard to religion, preferring to join the Unitarian Church. This fact interweaves rather well with my reading from the other week about the history of London’s graveyards. It was a long time before Non-Conformists, dissenters, suicides and other outcasts of the time were allowed to be buried in the typical Christian graveyards, and even then they were shuttled to a special isolated area on the sidelines. Suicides, for example, were originally buried at the cross of a crossroads (stuck as people believed in purgatory and unable to enter either heaven or hell). They also had a stake jammed through their hearts to make sure that they couldn’t come back and haunt anyone. Brutal. Good book. Somewhat superficial, but I think the author did the best that she could do with the not-very exciting life of her subject. This entry was posted in Uncategorized and tagged British, diary, domestic, epistolary, nature, Non-fiction, women by lizipaulk. Bookmark the permalink.